welcomes all students and scholars to SNU's vibrant intellectual community. Exchange program is for students in SNUs partner universities who wish to study at SNU for one or two semesters and transfer credits to their home institution. To be an exchange student, candidates must be officially nominated by their home institution and pay the tuition fee at their home institution. 1What is the difference between the Exchange Program and Visiting Program? COURSES STUDENTS CAN FREELY CHOOSE THE COURSES THEY WANT TO TAKE EVEN OUTSIDE THEIR MAJOR. NOTE: Some courses may have restrictions. 2How can I apply for the student exchange program? To apply for SNU student exchange program, your home university must first nominate you to SNU. Once nominated, SNU or your home university will provide you with the details about the application procedure. Please visit the following website to have more information. 3Why do I have to choose a preferred department during the online application process? Once we receive all your application materials, we will forward it to your preferred department (that you have selected during the online application process). The department’s committee will review your documents and will make a decision to accept you or reject you. You have to be accepted and admitted to your preferred department at SNU to obtain a status as an exchange student. 4How can I apply for the on-campus dormitory? Is dormitory space guaranteed? Dormitory application guide will be provided to the students who are offered acceptance letter from SNU. While all exchange students can apply for the on-campus dormitory, the dormitory assignment is not guaranteed due to limitation in dormitory spaces. 5How can I find an off-campus house in case I am not assigned on-campus dormitory? You can request for information on off-campus housing to the Office of International Affairs or ask your SNU buddy for help. While SNU will assist you in searching for housing, it is your own responsibility to obtain and maintain the off-campus housing contract. 6How can I register for courses? A course registration guide will be provided to the students who are offered acceptance letter from SNU. In general, a course registration period is scheduled at the end of July for Fall semester courses and at the end of January for Spring semester courses. 7Where can I find the course list and syllabi? You can find the course list and syllabuses on SNU course registration website http://sugang.snu.ac.kr. Please click here to download the instruction guide on how to search for courses. 8Can I take courses outside of my department? Yes, you can take courses that are provided outside of your department. However, please note that some courses are closed to outside students. 9How can I obtain a transcript for my credit transfer? The OIA will send an original copy of the transcript to your home university about a month and a half after the semester ends. 10When can I apply for a visa? You can apply for the student visa(D-2) after you have your acceptance packet from SNU. You have to visit a Korean embassy/consulate in your home country with the Certificate of Admission which will be enclosed in the packet along with other supporting documents requested by the embassy/consulate. Please contact your nearest Korean Embassy/consulate for more details on the visa application process. 11Can I study in Korea with a tourist visa? No, it is illegal for you to participate in student exchange program with a tourist visa. You must obtain a student visa(D-2) to study at SNU. If you have already obtained a different type of visa, you must check with the Korean Immigration Office(http://hikorea.go.kr) in advance to know if your existing visa type is applicable for student exchange program. 12Do you have a student group which helps exchange students? If so, how can I join the group? 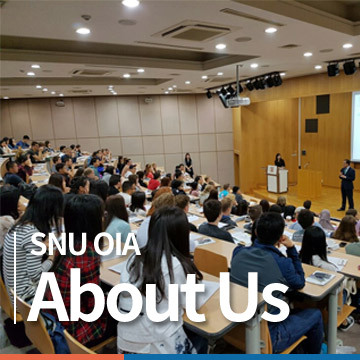 SNU runs a program called ‘SNU buddy’, a student group created to help exchange students’ settlement at SNU. SNU buddy organizes various events and activities throughout the semester. All exchange students offered acceptance will have an invitation e-mail to join the SNU buddy before beginning of the semester.